The Uí Chinnsealaigh were the dominant Gaelic family in this area and the mountain gets the fuller version of its name from them. This helps to distinguish it from Croaghanmoira, which is a little further north. Croghan Kinsella is the 273rd highest place in Ireland. CK was my final 600m peak in the Dublin/Wicklow and Blackstairs areas and I climbed it yesterday on the way back to Limerick from a social event in Kildare. The weather was superb, my rucksac thermometer read 23 Celcius! As I was 'just' peak bagging, I looked for a short route. Parking at the end of the road North of the NW spur, ( T120753 H) I noticed that there is a new fence which leads almost to the summit, which I followed. 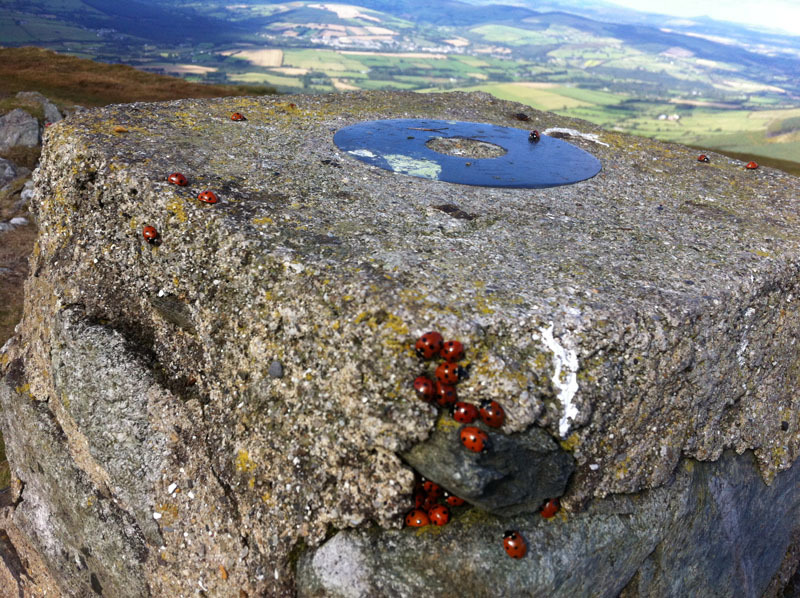 The Trig pillar had something I have never seen before - I hope the photo shows it- dozens of Ladybirds massing on the pillar and more making their way through the grass towards it. The views are superb...I could see the mountains of North Wales and another group of mountains further north too - probably the Isle of Man (in my earlier report, I said I could see the English Lake District - after some back of the envelope calculations, I now believe that's not possible! Apologies).